Next time you’re craving Pork Carnitas, try this Slow Cooker Pork Carnitas Lettuce Wrap version. Top it off with some fruity Mango Salsa for a fresh burst of flavor. Smithfield recently challenged me to create a 30-minute meal using their Marinated Fresh Pork Boneless Pork Shoulder Seasoned Carnitas. I knew I could do it, because life these days is pretty busy but we’re still managing to eat something homemade for dinner every night. With 4 kiddos and a multitude of sports and activities on any given day – karate, flag football, soccer, running club, 100 Mile Club, basketball, school newspaper, after school art club – my days only get busier once 3:15 pm rolls around. Oh, and did I mention that between the 4 kids we are representing 3 different schools and 2 districts? I love that our kids are active and well rounded in activities and that they have something fun and interesting to do that fits their personalities. I love that they’re building skills, both physical and interpersonal, by interacting with these activities. 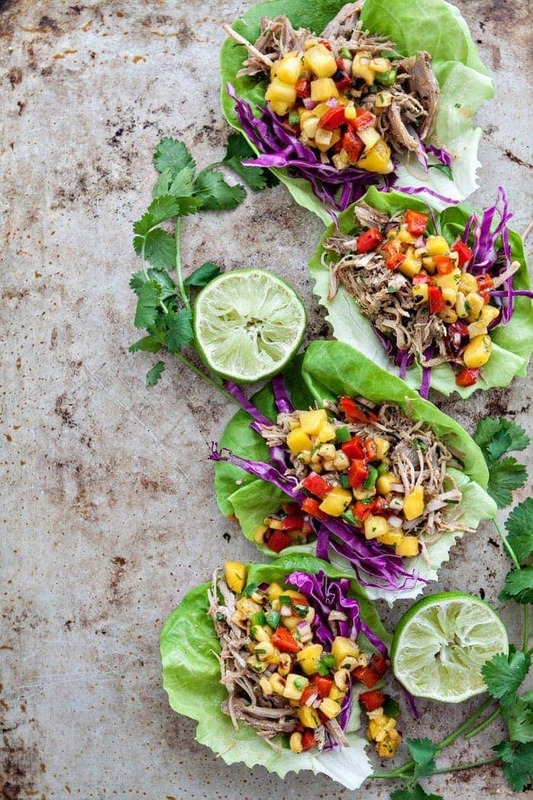 But, I need 30-minute meals, like this recipe for Slow Cooker Pork Carnitas Lettuce Wraps with Mango Salsa, to get us through the week and I think it wouldn’t be too proud of me to say that I think I’ve become a bit of an expert when it comes to shuffling kids to and fro while managing to get something pretty tasty on the table for us to eat. 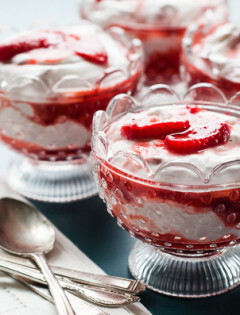 This recipe only calls for 30 minutes, maybe even less, of active prep time. First, you’re going to put the Smithfield Marinated Fresh Pork Boneless Pork Shoulder Seasoned Carnitas in the slow cooker with some liquid. The package recommends 1/2 cup of water, but I decided to mix it up with 1/4 cup each of orange juice and water to give just a touch of an extra flavor boost. 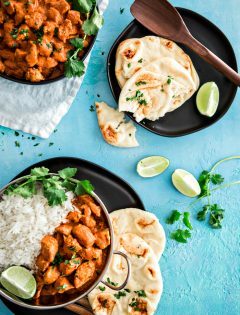 My best tip for quick meals that have really great flavor are to rely on easy flavor enhancements rather than a laundry list of complicated ingredients and fussy or tedious techniques. 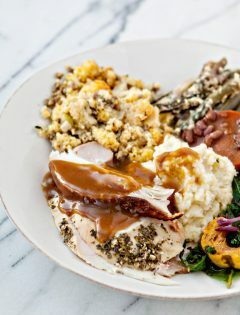 I love the convenience of the slow cooker on busy days! 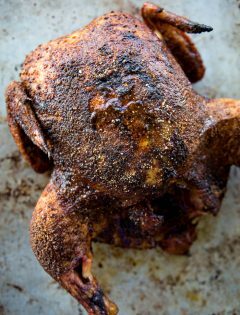 The pork then cooks low and slow for most of the day – while you are busy handling all the other things you need to get done, whether it be work or errands or household chores. Hello, set it and forget it! Plus, cooking low and slow in the slow cooker like that allows the pork to shred easily and the meat to be insanely tender. Check out these tips for How to Shred Chicken – they can all be applied to this Slow Cooker Pork Carnitas recipe. 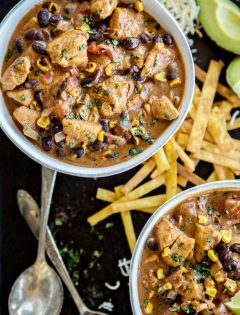 If you have time during the day, you can prep the Mango Salsa to go with the Slow Cooker Pork Carnitas and refrigerate it until dinner, or you can wait until you are getting ready to put dinner on the table to do the prep work for that portion of the recipe. Either way will work and the salsa stores just fine in the refrigerator for a day or two. You’re going to roast the corn and red pepper stovetop for the Mango Salsa. 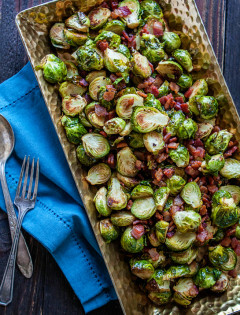 That’s another quick and easy fix to add a boost of flavor and depth to the recipe. 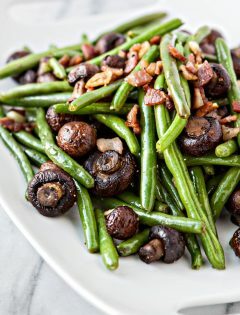 All you do is place the veggies, dry with no oil, in a cast iron skillet and let it sit until it becomes tender and a little blackened. After a few minutes, toss it around in the pan and let it sit a couple more minutes for some roasting on the other side. Super simple! Combine those veggies with the mango, jalapeño, cilantro, lime and orange juice. Season to taste with some salt and pepper if you like. 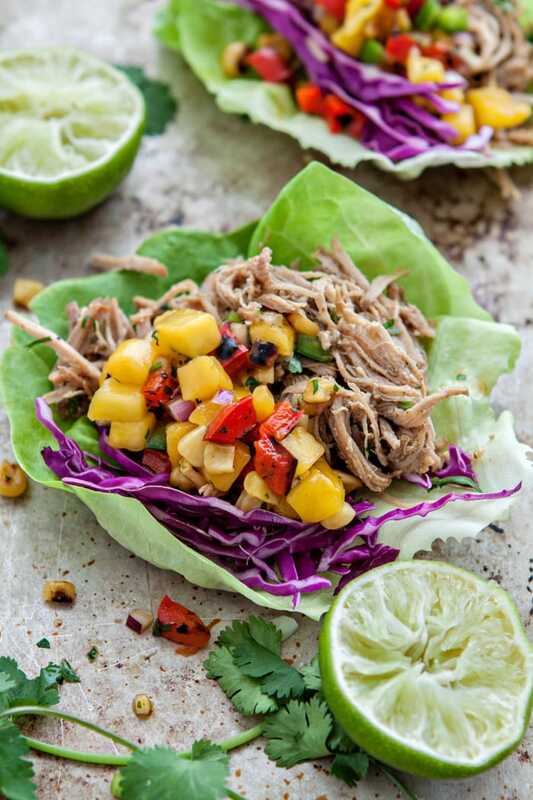 The Slow Cooker Pork Carnitas Lettuce Wraps with Mango Salsa are assembled by placing a bit of shredded purple cabbage (this gives it an extra crunch and pop of color) inside a butter lettuce leave. Then, top the cabbage with some Slow Cooker Pork Carnitas and a spoonful of Mango Salsa. Done and Done! 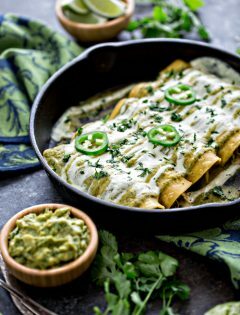 You can serve this with a side of 5 Minute Basic Guacamole if you like that with your carnitas. 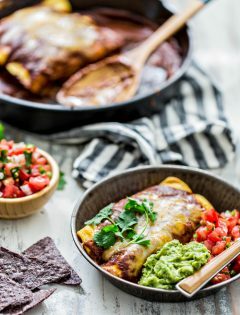 If you crave a little more bulk with your meals, you can definitely go the traditional route and place the tasty Slow Cooker Pork Carnitas inside a tortilla with the Mango Salsa, or add some Mexican rice or Roasted Poblano Cilantro Quinoa as a side dish to the lettuce wraps, but I personally love that this recipe is light and fresh. 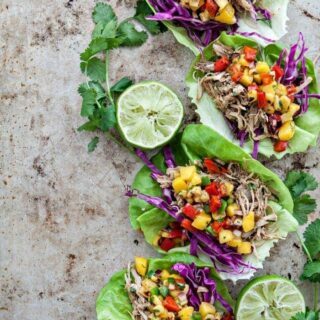 So, what do you think, are my Slow Cooker Pork Carnitas Lettuce Wraps with Mango Salsa a candidate for Real Flavor Real Fast? 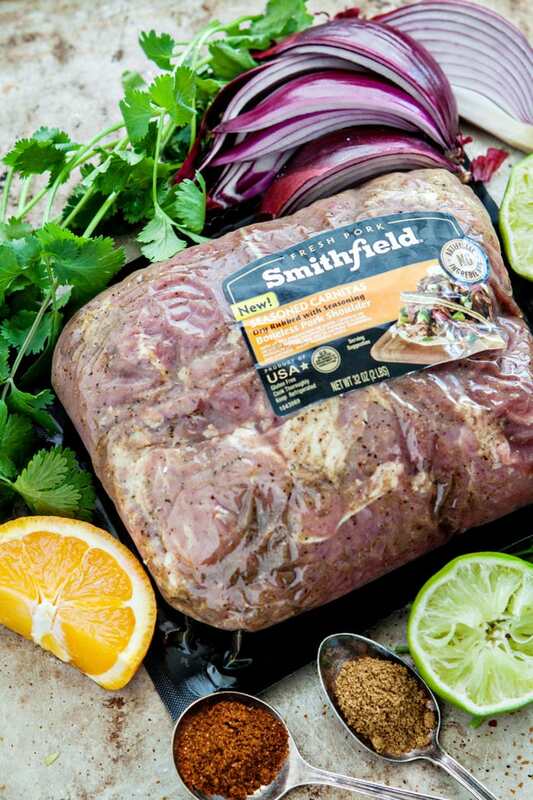 Smithfield is looking for your very best tips on how to get a meal on the table in 30 minutes or less using Smithfield Marinated Fresh Pork through the Smithfield Real Flavor Real, Fast Contest. Head over to SmithfieldRealFlavorRealFast.com and submit your original tip for a chance to win some awesome prizes. For more ideas to help you get dinner on the table quickly and recipe suggestions, like these Garlic Herb Pork and Onion Po’ Boys, check out Smithfield’s website. What is your favorite way to eat Pork Carnitas? Add the pork to the insert of the slow cooker along with 1/4 cup of orange juice, 1/4 cup of water, and onion. Stir to combine and break apart the meat cubes. Cover with the lid and cook on low for 6-8 hours or on high for 3 - 4 hours. After cooking the pork, remove the meat from the slow cooker, discarding any onion chunks and the juices. 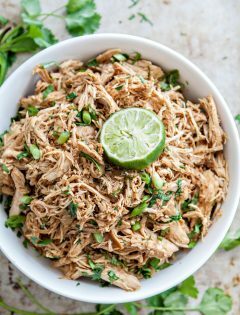 Shred the pork and return to the slow cooker with the remaining 2 tablespoons of orange juice, lime juice, cumin, chili powder, and cilantro. Stir to combine. Replace the lid, turn heat to warm (if available) or low (if warm is unavailable) to keep the meat warm while you prepare the remaining ingredients for the meal. Add the red bell pepper and corn to a cast iron skillet over medium heat and cook (dry, without oil) until it begins to roast and brown, about 5 - 10 minutes. In a medium bowl, add the mango, jalapeño, orange juice, lime juice, cilantro, and red onion Gently stir to combine. After the red pepper and corn mixture has finished roasting, add that to the mango mixture and stir to combine. Season, to taste, with salt and pepper (if desired). Serve the lettuce wraps with all of the components in separate plates or bowls to allow for individuals to assemble on their plates according to their liking. In each lettuce leaf, add a bit of the shredded cabbage. Then top the cabbage with shredded pork and mango salsa. To eat, fold the lettuce leaf in half and eat like a taco. Take care not to over stuff, and note that each lettuce leaf will hold different amounts because they vary in size. 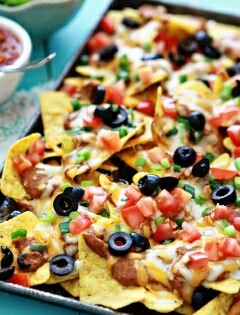 Additional accompaniments may include 5 Minute Basic Guacamole, lime wedges, shredded cheese, and/or salsa. I am privileged to have working relationship Smithfield on Good Life Eats. 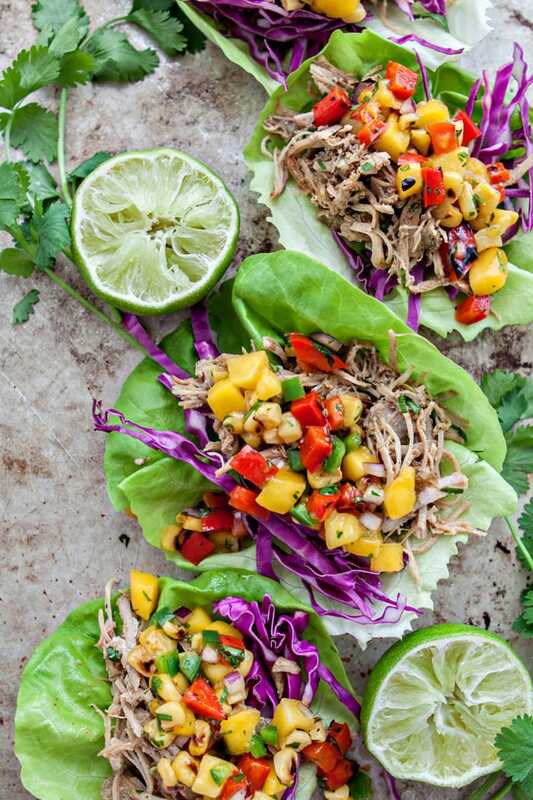 I’ve been compensated for my time in creating this recipe for Slow Cooker Pork Carnitas Lettuce Wraps with Mango Salsa, but as always – my opinions are my own! Looks sooo good, Katie! 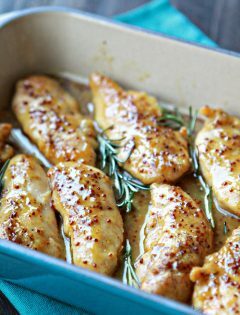 I totally want these for dinner right now! So lovely and summer-y! And your placement setting here looks beautiful. Ummm pork carnitas are the best. ‘Nough said. I could eat this every single week for the rest of my life. Beautiful!!! Thanks, Brenda! 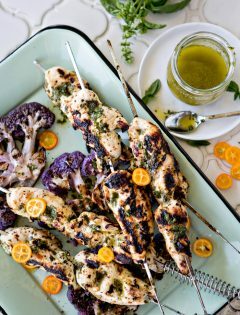 I love colorful recipes when spring and summer come around. I love the flavors here! Looks delicious! These are truly stunning. I would eat the heck out of these.